The Apollo 45681-330 is a combined sounder beacon base unit. This is an addressable product which is ideal for use in areas where not only audible alarms are required, but where visual alarm indications are also neccessary. The Apollo 45681-330 is a has a built-in isolator which means that seperate isolator points don’t have to be installed. It is supplied complete with an Xpert address card which allows the numbering of the detector which is to be installed onto it. 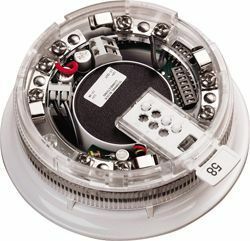 The address of the sounder beacon base unit is set using dip switches that are integral to the base. The Apollo 45681-330 is an ideal device to help comply with DDA regulations, as these units can be used to give a visual alarm activation warning to the buildings occupants. The base features an integral high output beacon which begins to flash once the fire alarm system has been activated. If you’re interested in the Apollo 45681-330 you may also be interested in our Apollo Fire and Notifier Fire Alarm Systems ranges.